This week, our team has shifted our focus to making it a priority to develop a stronger robot with its current capabilities. 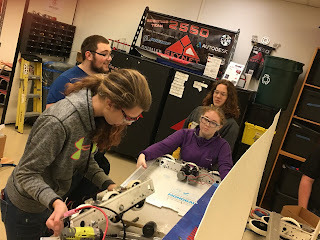 With this in mind, each team department has really solidified a lot of their projects and are in the midst of preparing to spend the last week of build season practicing for competition. Mechanical has updated their CAD model to our most recent plans and are continuing to work on building two robots for the season. Programming has completed projects with various sensors for competition use and has been successful with development and testing. Additionally, scouting has completed their forms and data analysis strategies that are ready to be tested by other departments. In our business department, students have made official submissions with our 8-bit arcade themed logos as well as implementing the "arcade" look to our promotional materials. Additionally, the safety team pulled yet another winner from our weekly safety drawing. Great job, Skynet for making safety first!